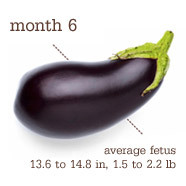 Now that Ive reached 28+1 weeks, we are officially into the 3rd trimester, and the baby is the size of an eggplant (or a chinese cabbage). Only 12 weeks to go which I'm sure is going to go so fast with Christmas first. We decided to go for a 3D/4D Mini Scan at Babes in the Womb at the weekend so that we could see the baby again and confirm it was definitely a boy before we buy anything else! It was so lovely to see him again and despite the fact he kept hiding his face with his hands and feet, we managed to get a few good 3D pictures. 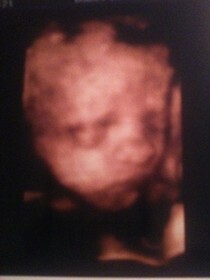 The sonographer confirmed that it is a boy and that he is around 2lbs 6oz just now. He has also still got his head up at the top so hopefully he will start to turn around soon. He is facing my back and as my placenta is at the front, and therefore between us, that explains why I'm not seeing any kicks at the front and why Graham cant really feel any either. 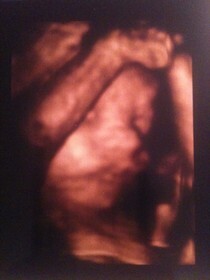 We were so glad we had gone to get the scan and felt it was definitely worth it. 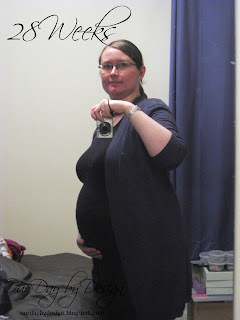 As you can see my bump is growing & growing, and normal tops are getting a lot harder to wear. From now on I'm going to try and take photos every week so I can see the progression to my due date. In the last few weeks we spent a week of it away with my family, saying goodbye to my sister, her husband & my nephew, who are now in Australia. With both of us pregnant we took the chance to get a photo together which ill share when I write about our trip. Since we got back, our flat clearing and decluttering has started and is progressing well; we have done our bedroom and got rid of the bed from the spare room. Now all we need to do is clear out the spare room double wardrobe then we can start painting the nursery. My dad painted our living room ceiling for us at the weekend and put up wallpaper for us on one wall, which along with our new rug totally transforms the room. Ive already mentioned most of the things we have got for the baby and we have an idea of what else we need but we would like to get a bit further with the nursery first. We did order the rocking moses basket stand we wanted with the last of our John Lewis vouchers and also picked up a cube storage unit and 3 storage cubes to put inside for the bottom of the baby's wardrobe since they were half price. Grahams parents brought us some clothes they had bought for the baby while on holiday at the weekend and I just picked up a gym ball which is supposed to help in the later stages of pregnancy! I have my first NHS antenatal class this week followed by another midwife appointment. I'm looking forward to both and I'm sure the classes will start to make it all a lot more real! We have also signed up for a course of the NCT antenatal classes as well which start in December, since Graham cant come to the NHS ones as they are all in the afternoons. I have lots of family and friends pregnant just now, with three due to arrive in the next few days; I'm looking forward to meeting all of the new arrivals. I am looking forward to hearing all about your antenatal classes! 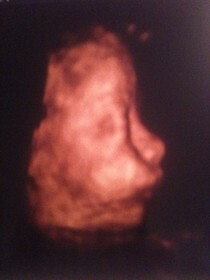 Wow - you can see his little face! He's adorable!! I think I would be a little freaked out having a 3D scan but I can completely understand why you had one And I agree with Lisa-Marie - looking good! !